What you are seeing is a love coin, to put a smile on someone’s face by expressing your love, gratitude, appreciation or the beauty you see in someone, by giving a coin away… Because how often do we tell this to each other? 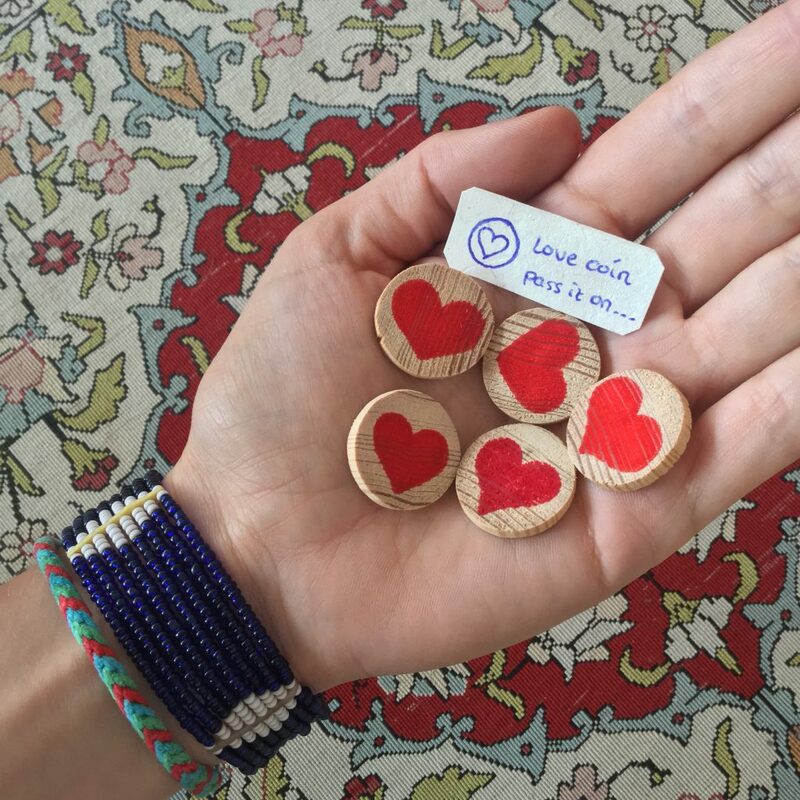 Giving a love coin is as nice and connecting as receiving one, and when you receive a love coin it is your turn to pass it on… You can give a love coin to someone you know, but also to a stranger, who inspires you or who you appreciate for one or another reason. How nice would it be when these love coins would circulate through society and people would express more their love and appreciation to each other? A love coin makes you feel seen and appreciated and creates a connection from heart to heart. Everyone is invited to make love coins and become an ‘ambassador’ to spread them around the world, as they are very easy to make. You can take an old broomstick or fallen branch of a tree (so the love coins are sustainable as well) and you can saw it into pieces, polish them and paint a heart on it. I want to create a website or platform where people can share their stories of their love coin experience, where you can find how to make them and where people can show themselves on a world map as ‘love-coin-maker’, so other people can contact you when they would like to have some love coins too. The website domain will be called lovecoinconnects.com, but it will take time to realize it. If there is anyone who would like to help me with the website, I am happy to get in contact.